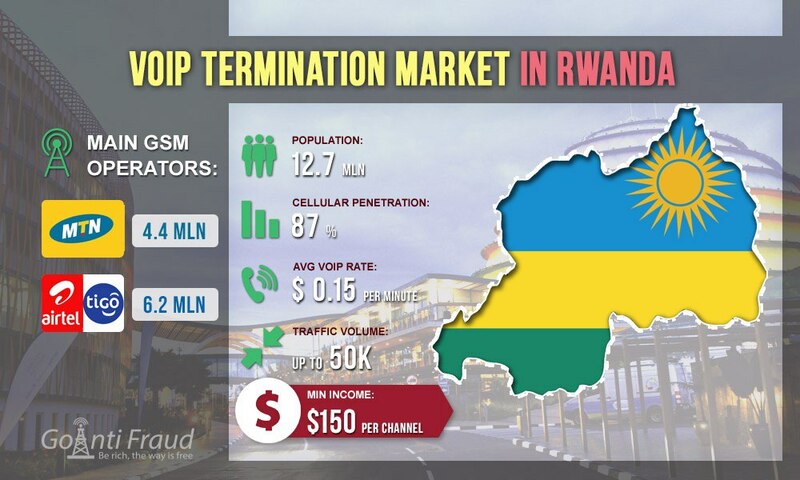 The African country of Rwanda can become a profitable route for voice traffic termination. With a population of over 12.7 million people, mobile penetration makes up 87% (over 10.7 million connections). Despite the low average rate in this direction ($0.045 per minute), cellular communication is cheap there, which ensures high earnings on traffic landing. Rwanda's telecommunications market is actively developing. This is facilitated by steady growth of GDP and significant foreign investments. At the same time, poverty remains widespread, which to a certain extent negatively affects the further development of the telecommunications market. The mobile sector has not been liberalized for a long time in Rwanda, so MTN has been a monopolist for a long time in this segment. In 2006, GSM operator Rwandatel emerged in the market, which ensured effective competition. Also, in 2009, the operator Tigo started working. In 2011, Rwandatel stopped providing their services and Tigo merged with Airtel later. KTRN (provides 4G services only). Airtel-Tigo currently owns 58% of the total number of mobile subscribers in the country, while MTN - 42%. SIM cards in Rwanda cost about $ 2 each. Local cards can be bought at many outlets in the country, kiosks, as well as at the international airport. However, the law requires you to show your ID and immediately register the SIM-card. Also, one user cannot buy more than three SIM-cards. Therefore, we recommend that you take care of buying a large number of cards in advance from the dealers who sell new SIM-cards already registered to someone's name. They can be found on dedicated online forums and social networks. Cellular communication in Rwanda is cheap; the cost per minute can be up to $0.003. You will earn at least $150 from each gsm wireless gateway channel, provided you choose the right tariff plan and competently bypass the operator’s anti-fraud systems.